Scientific name: Casuarius casuarius johnsonii. 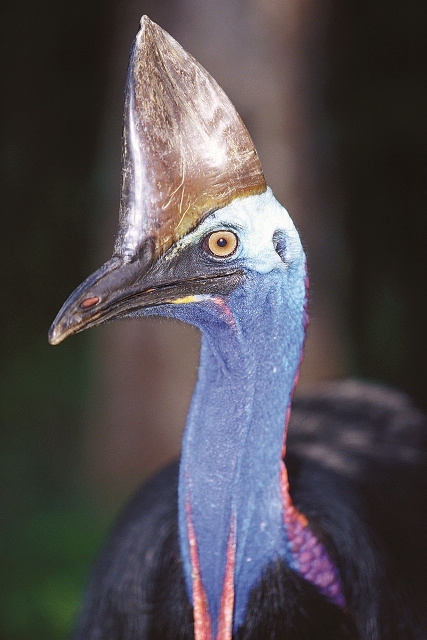 Other Names: Australian or Double-wattled Cassowary (Marchant & Higgins 1990). The Southern Cassowary (hereafter “the cassowary”) is one of only three species of the Casuariidae family, which also includes the Dwarf Cassowary Casuarius bennetti and Northern Cassowary Casuarius unappendiculatus. 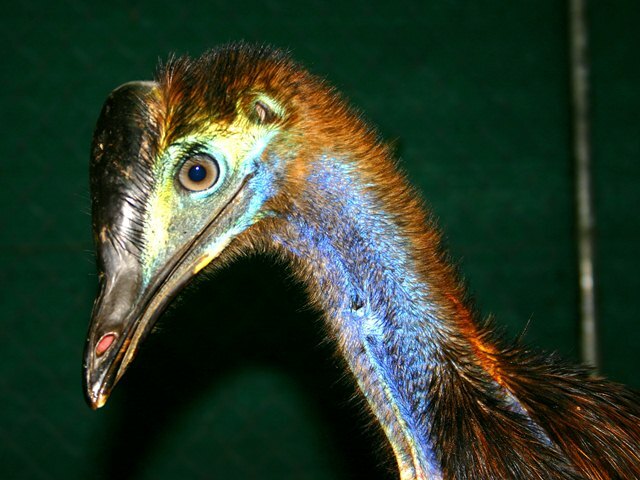 Cassowaries belong to the order of Ratites (Struthioniformes) which also includes emus, ostriches, rheas and kiwis. 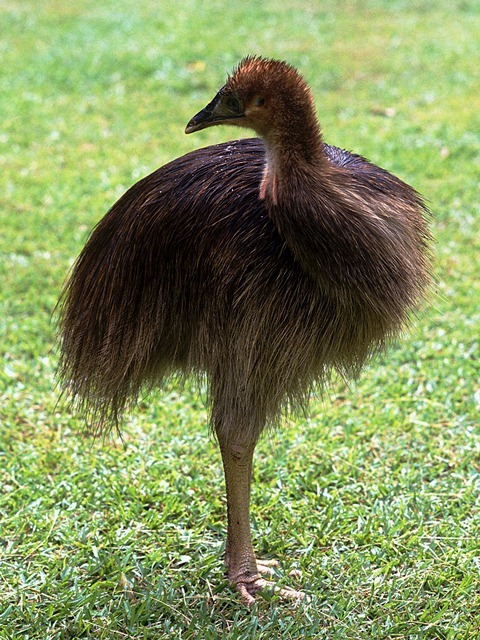 The now-extinct moas of New Zealand and the elephant bird of Madagascar were also Ratites. The Southern Cassowary Casuarius casuarius johnsonii is a flightless bird with glossy black plumage, a tall, brown casque (helmet) on top of its head, a vivid blue and purple neck, long drooping red wattles and amber eyes. The purpose of the tall helmet or casque is unknown but it may indicate dominance and age, as it continues to grow throughout life. 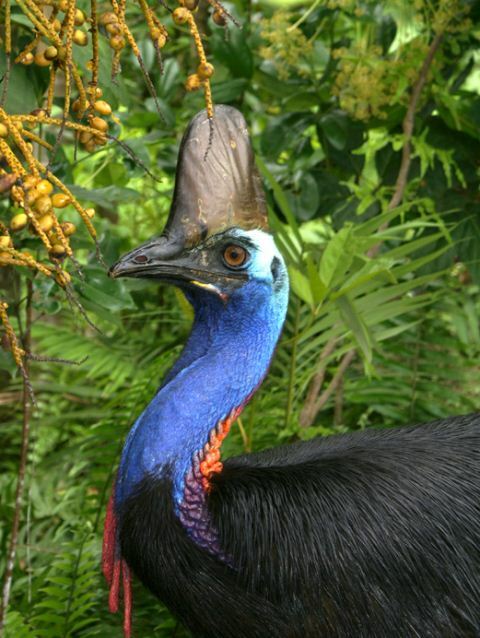 Recent research indicates it may also assist cassowaries in “hearing” the low vibrating sound made by other cassowaries, which carry over long distances but might otherwise be hard to hear in dense rainforest. Dinosaurs are also believed to have used infrasound, but the only other living animal to do so, is the elephant. The cassowary has coarse hair-like feathers which lack the barbules that usually hold birds’ feathers together. Two feathers sprout from the same shaft, and the cassowary lacks oil glands with which to waterproof its feathers. It has no tail feathers, and its wing stubs carry a small number of long, modified quills which curve around the body. 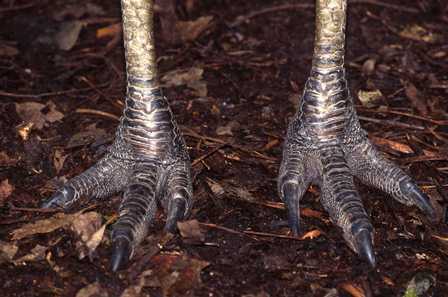 Each heavy, well-muscled leg has three toes, with the inside toe bearing a large dagger-shaped claw (up to 120mm long) used for scratching and fighting other birds and for defence. 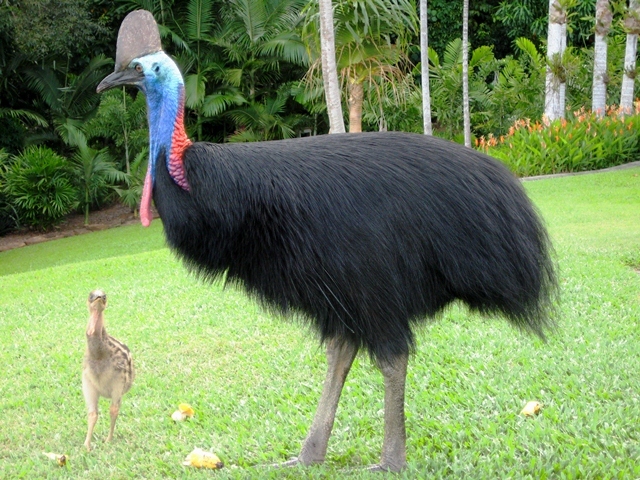 Adult cassowaries can grow to 2m tall. The sexes are fairly similar in appearance, though females tend to be slightly larger and can weigh up to 76kg. Males can weigh up to 55kg, and have a slightly longer “skirt” that helps to cover the eggs while brooding. 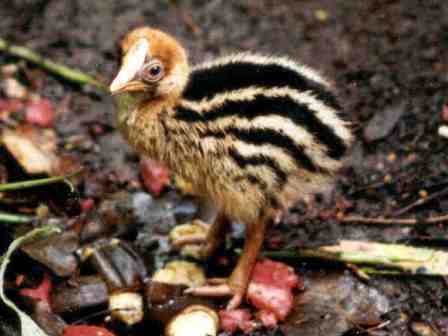 Newly hatched chicks are striped dark brown and creamy white. After three to six months the stripes fade and the plumage changes to brown. As the young mature, the plumage darkens, the wattles and casque start to grow and the neck and wattles begin to develop their striking colours. The cassowary is mature by about three years of age.